In her new book, Hillary Clinton says many political reporters "can't bear to face their own role in helping elect Trump, from providing him free airtime to giving my emails three times more coverage than all the issues affecting people's lives combined." She believes the media playing field was tipped in Donald Trump's favor during the campaign. And she thinks there should be more liberal-leaning shows and publications to counteract a right-wing media apparatus that she calls "propaganda." 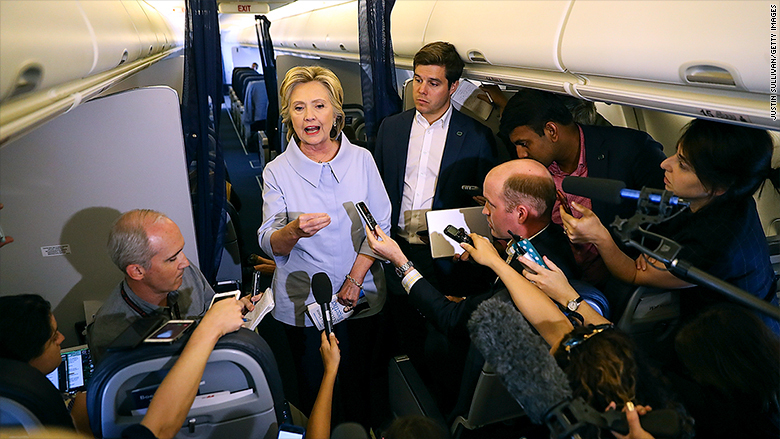 Clinton's views about the media landscape are coming forth in "What Happened," which came out Tuesday, and in a publicity tour for the book. Her comments are reigniting debates about media coverage of the 2016 campaign, and about deeper issues involving media consolidation and ownership. In some cases, Clinton is just echoing media critiques that her supporters have been expressing for years. For instance: In an interview with the progressive hosts of the "Pod Save America" podcast, she asserted that TV networks spent too much time showing "empty podiums" at Trump rallies and too little time covering policy issues. But she is also speaking bluntly about what she believes are the negative effects conservative media has on the country. "The other side has dedicated propaganda channels. That's what I call Fox News. It has outlets like Breitbart and crazy Infowars and things like that," Clinton said on the podcast. She said "Fox doesn't even pretend anymore. They don't even cover stuff that is not going to promote the Trump agenda." She also brought up what she said was the right's money advantage through conservative billionaires like the Mercers, who have bankrolled Breitbart. Speaking about the Democratic "disadvantage," she said, "you've got billions and billions of dollars coming at you from the other direction." Clinton also cited Sinclair Broadcast Group, a major owner of local TV stations, as a "new threat." Sinclair has been running conservative commentary segments on its stations. To Clinton, that means "72% plus of the homes in America" are "being given a steady diet of right-wing Republican politics." Her point, speaking on the "Pod Save America" podcast, was that Democrats need more formidable media platforms of their own. "I don't understand why people who share our views aren't more willing to invest in media that can be competitive," she said. "Because what you've got is a right wing advocacy propaganda, and you've got a kind of mainstream media that engages in false equivalency. And it's tough, if you are a Democrat, trying to navigate through that." Clinton recently endorsed Verrit, a liberal site that calls itself "media for the 65.8 million," meaning for people who voted for Clinton. Verrit, which was founded by a staunch Clinton supporter, has come under heavy criticism for its unclear business model and editorial strategy. In "What Happened," Clinton writes warmly about the reporters who followed her around every day, and she said she was "delighted that many of the journalists assigned to our campaign were women." "During the 1972 presidential campaign, the reporters who traveled with the candidates were called the boys on the bus," she wrote. "By 2016, it was the girls on the plane." In the book, Clinton repeatedly accepts blame for losing to Trump. But she also re-litigates some of the media-related controversies of the campaign season. On the podcast, she also claimed Trump "was never held accountable" in interviews or debates -- a comment that many interviewers and moderators would surely dispute. Overall, in the podcast interview, she said journalists and many voters were seduced by the "entertainment value" of Trump's candidacy. She said people in newsrooms should recognize their "really solemn responsibility" to the public. Later this week Clinton will be giving interviews to ABC, NBC, CNN, and other outlets. She'll be appearing on the "Today" show, which is notable because in the book, she singled out "Today" show co-host Matt Lauer for specific criticism. She called out Lauer for questioning her about her private email server during the "Commander in Chief forum" on NBC last fall, while treading softly in questioning Trump, a criticism that many observers shared at the time. "Trump should have reported his performance as an in-kind donation," Clinton wrote. "Here's another example where I remained polite, albeit exasperated, and played the political game as it used to be, not as it had become. That was a mistake."